when i had my zrx 1200 this was the trick thing to do. steel dragon can make them any size/length. they have built in screens too. i bought a set and never mounted them. just thought i would pass it on. They're beautiful, but not something I would put on an engine unless all it ever did was run 1/4 mile occasionally. Not very practical on a small displacement engine. they have screens built into them. Last futzed with by maverick9611; September 14th, 2017 at 02:34 AM. i wonder what main jet you would have to use? they screens built into them. Screens keep birds out, but don't do anything to stop small grit, dust, sand, etc., from grinding the engine to shreds. 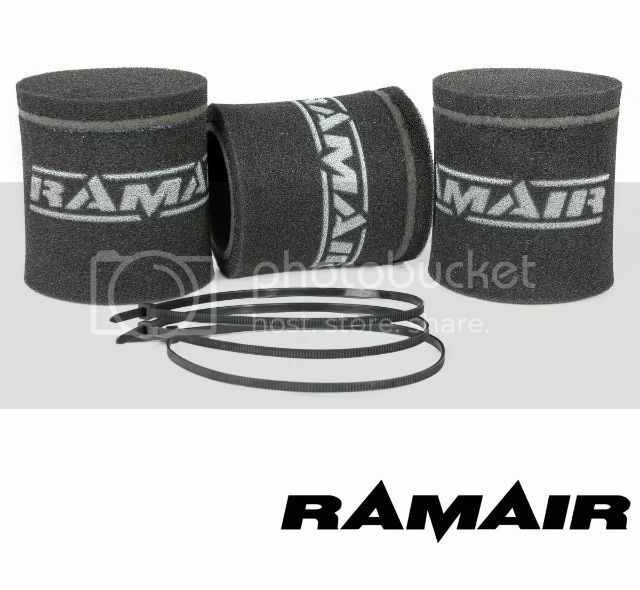 ram air makes sock filters for them. their on ebay and amazon too. i might try the stacks, might calm the air down prior to entry into carb. i know cv carbs don't like turbulent air but everybody with pods disregarded the memo. i've contacted steel dragon for a price quote. I know several guys who run pod filters with extension tubes between the filters and carbs, and report great results. They made them from PVC plumbing parts. Foam filters over the stacks should work well too. Very nice looking V-stacks. May not be a good choice for constant velocity carburetors. V-stacks should be limited to race bikes because the screens aren't going to protect your engine from silicon dioxide particles which are present in all soil everywhere on earth. This stuff is highly abrasive and we know what that can do to an engine. Uni may sell something like that made for velocity stacks too, I'm not sure. ram air are made specifically for stacks. they call em socks. The screens in the stack do absolutely awful things for airflow and really defeat the purpose of having a velocity stack in the first place. The whole point of a good air filter is to increase the surface area to minimize the loss of flow as much as possible and restricting the filtered area to a small screened area is, well, if you're using them to look cool, go for it. If you think you'll get more power, forget it. There is a reason modern racebikes have big airboxes. It's because the total volume of air in the box is relatively slow moving, and the slower the air, the higher the pressure and that means more efficient cylinder filling. Also, bikes with open velocity stacks are much more susceptible to carburetion problems due to turbulent air, crosswinds, etc. Velocity stacks may work well on a dyno indoors with no breeze, but when the bike is moving through the air at 80 mph you will get a different story when it comes to airflow and power. This is because there will be air turbulence that will change as the bike and rider move. An example of what turbulent airflow will do: I had an SV650 racebike with the filter installed in the airbox but no lid on the airbox (a common SV650 mod) I had also modified the bottom side of the gas tank to increase fuel capacity. Modifying the gas tank also meant that I had to raise the tank on its mounts. I started having issues with the bike stumbling while on the gas in some high speed corners. It was very puzzling until I realized that it was a windy day and the crosswind was playing havoc with the carburetion due to it blowing across the top of my airbox from the side and disturbing the aiflow into the box. So even with an airbox you can get caught out sometimes but with just velocity stacks its much more likely. I have a good sized K&N air filter with no airbox on my Ninja 250 racebike now and it does pretty good. The only reason I removed the airbox because it is a giant pain in the a** when working on the carbs. If I keep developing the bike for next year, I will make a better airbox out of carbon fiber and I would expect that it will perform better than with just the K&N. Now, put the right velocity stacks inside an airbox (without those awful screens) and then you may start getting somewhere. But even so, velocity stacks by nature will work better only at certain rpm ranges. That is why bikes like the Yamaha R6 have velocity stacks that move in and out which changes the effective length and makes better power over a wider rpm range. I agree. V-stacks inside the airbox is a better start. I also don't think those foam socks are going to flow as much air as the stock filter. i’m going to try with no inner screens and ram air socks. trying to get ahold of steeldragon. Many people discount this with pod filters - same thing applies. The air going over an open pod filter is turbulent in addition to moving the wrong direction - which is effectively creating a vacuum or at least working opposite the direction of intake flow. You may see more power on a dyno with pods/stacks/nothing at all, but it doesn't necessarily translate to the real world. not if i go with a longer stack. might calm air down prior to entry. steeldragon did contact me and are waiting measurements from me. i'm doing this project as a hobby experiment. Hey, I'll bet Triple Jim has some leads for you. The triples are a-lot of fun. Just don't expect it to handle real well. "Cycle" magazine used to refer to them as "flexible flyers". Get a 73' 500 it got the best ignition system. 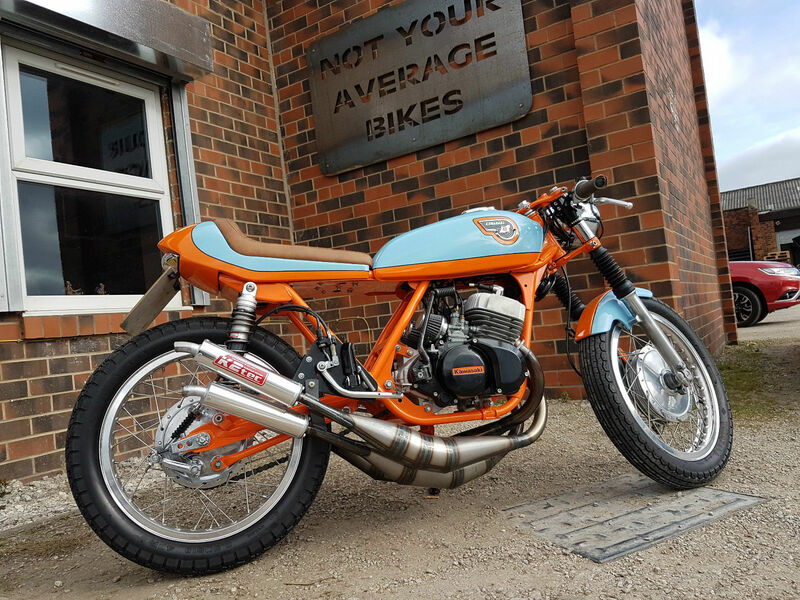 When I converted my Honda 500 single from Keihin to Mikuni I considered a flat side. Spending some time on the internet I learned that they are a be-aach to tune for low to mid range performance. Nice flat-out though. Don't hesitate to check into student aid from the state. Georgia has scholarships and grants available, but I don't know the specifics. In the day, triples handled about like other bikes of the time, as proven by their record of stock class race wins. It doesn't take much tweaking to make them handle quite well. The 1973 H1D had essentially the same magneto CDI system that the H2 had, with one CDI unit for each cylinder. The KH400 had a similar system, but not identical. '74 and '75 H1s and later KH500s had magneto CDI, but used a single CDI unit and a distributor on the coil primaries. The early H1s had 12v powered CDI systems with an automotive type distributor. Two important modifications to improve the H1 and H2 handling were to replace plastic swing arm bushings and move the front brake caliper to the rear of the fork tube. It took me 10 years to get my hands on one of these model kits. It's a very detailed kit with metal etched spokes on the wheels. This one came directly from Tokyo. Hey, a good thing to do this winter - I'm getting nostalgic. Chucking the original flexible clamshell caliper(s) and changing to a single later EX type 2-piston caliper with EBC HH pads will do wonders for braking. Going to longer rear shocks also makes a noticeable improvement in handling. Tight swing arm bushings and head bearings are important on the old triples as well as all other motorcycles! But don't run open velocity stacks on one. No V-stacks? Because that all roller/ball crank will be toast? Never did. I did run K&N pods for a while but switched to switched to Uni's permanently. Never tried longer shocks but I did run Konis. I wish you never mentioned that 400 triple. Thanks. I'll keep him in mind.